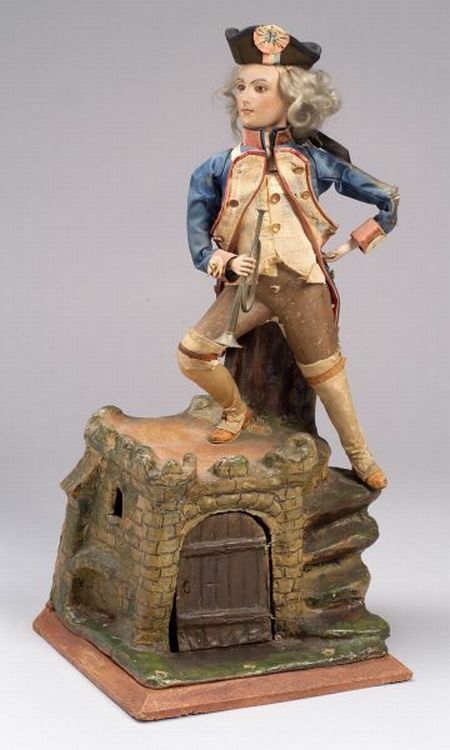 Rare Henry Vichy Phonograph Automaton of a Trumpeter, modeled as a French soldier with papier-mache head, brown glass eyes, feathered brows, open-closed mouth with painted teeth, and metal hands holding a trumpet, on architectural papier-mache base in the form of a castle with painted stone turrets, and spiral stair to the battlements, a door in the base for access to the three-cam going-barrel automaton movement with pulley-drive to Lioret "Le Merveilleux" phonograph with 3/4-inch diameter wax cylinder and traveling reproducer, dressed in the original blue and red satin jacket, curled white mohair wig, tricorn hat trimmed with French colors, chaps and leather-covered boots, ht. 21 in., (costume, movement and paintwork in good original condition, breeches missing). Note: Henry Desire Vichy, born in 1866, was active in his father's firm from the early 1890s. He traveled extensively in the United States (at one time he planned to open an American branch of the family firm) and was at different stages of his life a professional draftsman and sculptor. 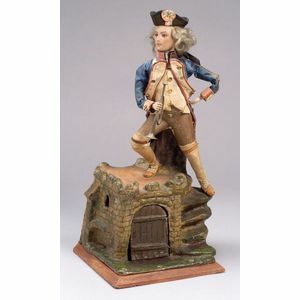 Some of the Vichy firm's most imaginative automata were produced during this period, and their modeling may have been the work of Henry himself. His innovative approach to the automaton business meant that Henry was quick to see the potential of Lioret's "Le Merveilleiux" phonograph already in use in the Jumeau phonograph dolls. Its small size and simple design - a 3/4-inch celluloid cylinder on a brass drum and large-diameter sapphire reproducer - was a departure from the phonographs of Edison and Columbia which dominated the market, and made it ideal for inclusion in an automaton. By 1895, Henry Vichy was advertising automata which "speak, sing, and actually play various instruments". However, the reliability of these automata must have been questionable, as only a handful have survived with their original phonograph mechanisms still intact. Like other known Vichy / Lioret automata, the phonograph itself operates with an intermittent movement. The automaton movement drives three cams with runners; the first two control the figure's actions, the third the raises and lowers the reproducer onto the turning cylinder at appropriate periods of the sequence. When the soldier turns his head and raises the trumpet to his lips, the reproducer is engaged and sound (originally a trumpet call) is produced. When he turns his head in the opposite direction and lowers the trumpet, the reproducer is disengaged and the sound ceases. The papier-mache base is designed to amplify the sound through a side window and the hollow tree stump that the soldier leans on. The Vichy / Lioret phonograph automata represent a rare combination of sound and motion in two contemporary, but very different, industries.